န (L) Men walk past the Victoria Memorial during a spell of monsoon rain. (R) Pedestrians share an umbrella as they cross the street during a spell of monsoon rain in Kolkata today. 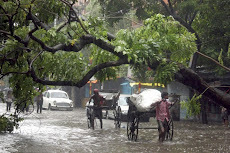 Monsoon hit several northern states bringing respite from a heat wave more intense than ever. 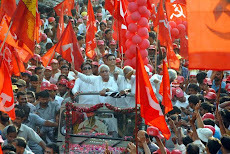 BBC News, New Delhi, 30 June : A report on the 1992 demolition of the Babri Masjid (mosque), which sparked nationwide communal riots, has been submitted to the Indian government. 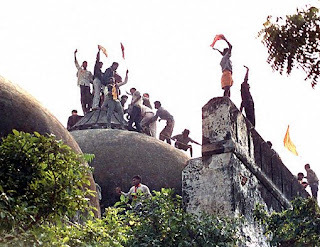 The Liberhan commission was set up to investigate the events that led to a Hindu mob tearing down the disputed mosque in the town of Ayodhya. The commission has taken 17 years to complete its investigation, which cost more than 65m rupees ($1.3m). The contents of the report have not yet been made public. New Delhi, 30 June : Nirupama Rao, India’s ambassador to Beijing, was today named the next Indian foreign secretary. 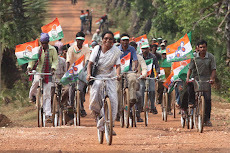 She will succeed Shiv Shankar Menon who retires on 31 July. Nirupama, a 1973-batch IFS officer, is the second woman to be appointed foreign secretary after Chokila Iyer who had a brief stint in 2001. 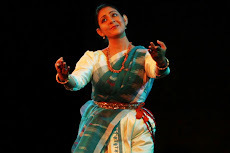 Nirupama was the first woman spokesperson for the ministry of external affairs. 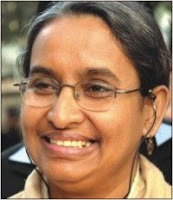 A postgraduate in English literature, Nirupama topped the IFS in 1973 and joined the service at the age of 21. Lok Sabha speaker Meira Kumar, the Lok Sabha’s first woman Speaker, was from the same IFS batch. Nirupama has also served as Indian ambassador in Peru and Sri Lanka and as the deputy chief of mission in Moscow. 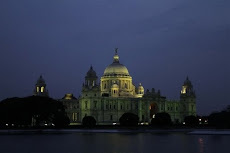 Kolkata, 30 June : Bhupinder Singh, who took over as state director-general of police on Tuesday, said he will try to bring about reforms at the police station level in a bid to restore people's confidence in the force. For the moment, his attention will be on ridding the state of the Maoist menace. In the long run, his endeavour will be to start a continuous process of better policing. "I have served the people of this state for 34 years. This chair will give me further opportunity to do so. I hope to make an impact. It is true that confidence in police has eroded to a certain extent. 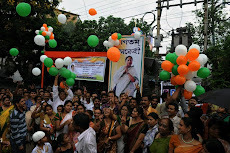 But people are watching how we have countered the Maoist menace in West Midnapore. Hopefully, the negative ideas will change to a certain extent," Singh said immediately after taking charge. 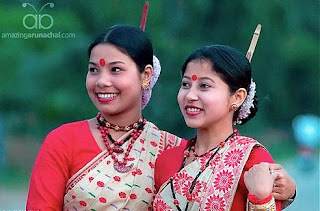 Guwahati, 29 June : Girls below poverty line in Assam now have a 10,000-rupee reason to withstand marriage until they turn 20. Like most states across India, Assam has a dismal record of underage marriages. 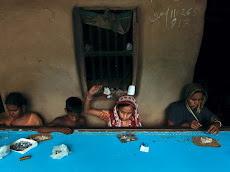 Official estimates say over 45 per cent of girls in backward, rural areas are married off soon after attaining puberty. In a bid to reverse this trend, Assam Chief Minister Tarun Gogoi announced a financial incentive to every BPL girl who ties the knot only after turning 20. 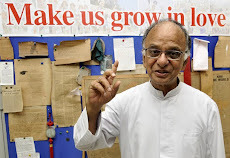 “We hope this one-time award of Rs 10,000 serves its purpose,” he said while presenting a deficit budget of Rs 4615.11 crore on Monday. 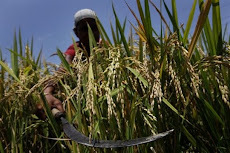 PTI, Kantapahari, 30 June : Security forces on tuesday further consolidated their grip over Maoist-held areas in West Mindapore district and launched combing operations in 22 villages of Lalgarh. 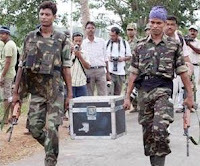 With Kantapahari recaptured, all borders of Lalgarh had been sealed, a senior police officer said. 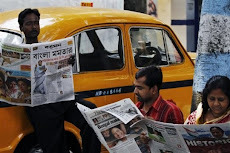 Dhaka, 30 June : Turnover on the Dhaka Stock Exchange on Tuesday crossed the Tk 9 billion mark for the first time ever, as investors shrugged off a hoax bomb threat that shut trading an hour earlier than the scheduled a day before. Daily turnover touched a new high at Tk 9.42 billion on the day the parliament passed the budget for FY 2009-10, smashing the previous high of Tk 8.34 billion on 21 June. This is the fourth time this month that the daily transactions have leapt to a new height. On 4 and 11 June , turnover on the bourse touched Tk 6.72 billion. It soared to Tk 7.81 billion on 7 June. Jalpaiguri, Kolkata, 30 June : Pygmy hog the world's smallest and rarest wild pig, which is on the verge of extinction, will soon come to Gorumara National Park, to be precise. Sus salvanius (its scientific name), is barely 60 cm long, 25 cm high and weighs about 8 kg. It was originally found in the Himalayan foothills across Assam, Nepal and the Dooars. It was declared extinct in 1960. Evidence that pygmy hogs still survived in the region was found in March 1971 by British naturalist J Mallinson at the Barnadi wildlife sanctuary in north-western Assam. He found hog meat being sold in local markets. However, the animals couldn't be protected then. Then, in 1977, British scientist William Oliver found pygmy hogs in Assam's Manas Biosphere Reserve. Since then, they have remained confined to these forests. 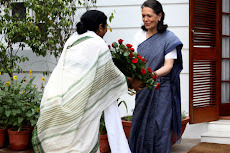 Now, WB government wants them back at the Dooars, their original home. 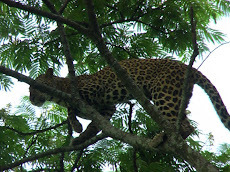 Prodded by the state forest department, the Zoological Survey of India (ZSI) has initiated a feasibility study. Once that is done, the forest department will have the hogs brought over from Manas and get on with the breeding project. 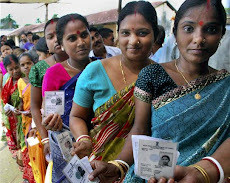 Agartala, 30 June : About 15,000 candidates have submitted nominations for election to 5676 seats of three-tier Panchayat in Tripura, including 5295 seats in village Panchayats, polling for which would be held on 20 July. State Election Commissioner Y P Singh told mediapersons here today that the entire report had not yet been received by the commission and so far the complete details of 12 revenue blocks out of 42 were collected, adding there was no report of any untoward incident during filing of nominations. 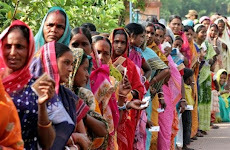 According to report, 6427 candidates, including 2372 women, have filed nominations for village Panchayat seats in 12 blocks. 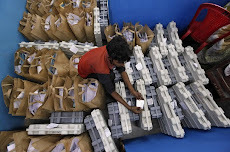 Out of these, 2980 are from CPI(M), 3029 from Congress, 46 from Trinamool Congress, 22 from CPI, five each from Amra Bangalee, PDF and INPT, 41 from JD(U) while 92 Independent candidates filed nominations. 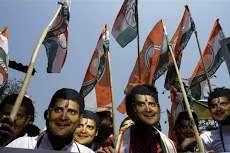 Meanwhile, 423 nominations were filed for Panchayat Samitis in 13 blocks, including 158 women, where both major parties Congress and CPI(M) are contesting 184 and 177 seats respectively, besides six other political parties, including two each from CPI and RSP. 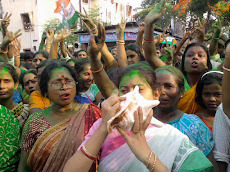 Similarly, 218 candidates, including 59 women, filed nominations for 82 seats in Zilla Parishad where CPI(M) is contesting 82, Congress 83, BJP 23 and Trinamool Congress four seats, Singh added. Agartala, 30 June : Tripura government has renewed it's alert against recent outbreak of swine flu across the world while advised the citizen to stay away from consumption of pork. Health Commissioner Y P Singh said here today that there was no incidence of swine flu reported in the state so far but the concern specialists had already prepared the treatment protocol and made interim isolation arrangement in state Tuberculosis unit under government medical college, if any case found. ''Launching swine flu isolation unit in TB ward is a temporary arrangement and if required, we shall make separate unit with all isolation facilities,'' Singh said adding ''with the advice of Union Health Ministry, authority had been holding frequent district level meetings involving Health and Animal Husbandry department officials.'' 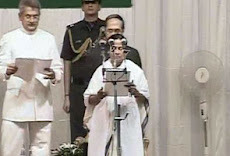 Meanwhile, Health Minister Tapan Chakraborty has pointed out the fear of a possible attack of swine flu stems from the large number of piggeries that have mushroomed across the state coupled with the high rate of pork consumption by tribals and large sections of non-tribals and added that more than three lakh people were directly connected with the piggery business. Dhaka, 29 June : Bangladesh opposition leader Khaleda Zia Monday sought the help of Prime Minister Sheikh Hasina for sending a separate team to visit the Tipaimukh dam project site located in India's northeast. She accepted a suggestion made last week by Hasina that the opposition was free to send its own team, Star Online reported. Hasina's government has offered to compare the report of the team sent by the opposition party and that of a parliamentary delegation that it plans to send. India may now have to host the visits of two separate teams to the site of the proposed dam on the Barak river in Manipur state. Zia's move, made through a formal letter sent to Hasina, adds a new dimension to the raging controversy. 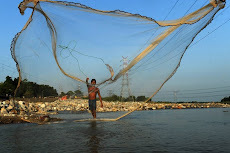 Opposition parties and sections of environmentalists, NGOs and experts on river valley projects say that the lower riparian Bangladesh stands to lose in terms of its share of water if India builds the dam to produce power. 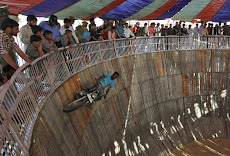 Zia had earlier this month addressed a letter to Indian Prime Minister Manmohan Singh urging him to drop the project. 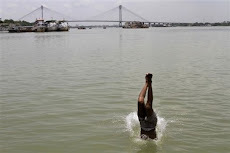 Part of the Brahmaputra river system, Barak flows from India into Bangladesh where it divides into two and eventually flows into the Meghna. 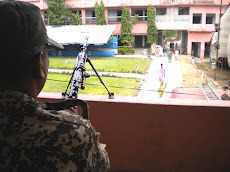 Indian Security forces reach Maoist hub "Katapahari"
PTI, Katapahari, 29 June : Further consolidating their position in the Maoist-infested areas of West Midnapore district, central forces on Monday stormed Katapahari, the hub of the Naxal-backed tribal agitation. 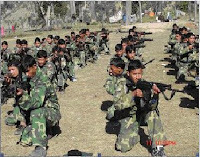 Completing one third of the operations, 1,600 personnel from the BSF, CRPF and special anti-naxal force COBRA converged on the hamlet from Lalgarh and Ramgarh which were captured by paramilitary forces after remaining under control of the Maoists for eight months. A helicopter hovered in the air to spot the Maoists and help the personnel carry out their operation with precision. 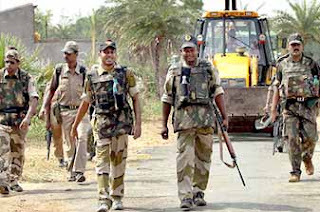 DIG CID (Special Operations Group), Siddhinath Gupta said that the forces were now in Katapahari, where a police camp existed in 2005 before being withdrawn. "A camp will be established here after all these years," he said. DIG (Midanpore range) Praveen Kumar said the operations had not ended. "Entering Katapahari was part of it." A senior police officer, however, told PTI that one third of the operations were complete. 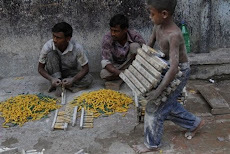 Midnapore SP Manoj Verma said "There was no police in Katapahari for the past several months. 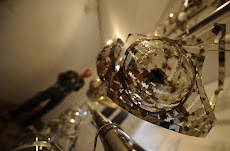 People have come forward to cooperate. We hope this cooperation will continue. We will establish the rule of law to solve the problem that has been plaguing this area for several months." 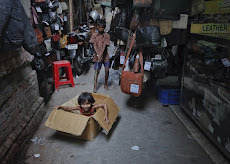 Reliefweb.int, Dhaka, 29 June : Over the past two months the local authorities in Cox's Bazaar District, southeastern Bangladesh, have torn down scores of makeshift huts belonging to an estimated 1,000 Rohingya refugees. Dhaka, 29 June : A bomb threat forced the Dhaka Stock Exchange to shut down an hour earlier than the scheduled close of trading on Monday, an official said. Authorities halted transactions at 1:15pm and then evacuated the building. An unknown caller said that a bomb had been kept inside the building, according to the official. 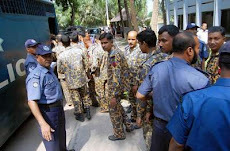 Bomb experts of RAB arrived at the spot at about 1pm(BDST) and were searching the building. Nobel prize proposal for Prime minister Sk Hasina !! 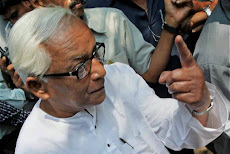 Dhaka, 29 June : Awami League MP Akhteruzzaman Babu has proposed that the parliament adopt a resolution urging the Nobel Committee to honour prime minister Sheikh Hasina with the Nobel prize. "I have been in politics with her for 26 years. 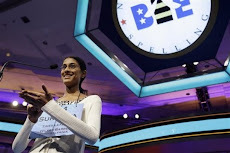 I think she should get the Nobel Prize," Babu said as he spoke on the proposed national budget for 2009-10 fiscal year on Monday. The proposal was greeted with table thumping by the ruling MPs in the House being boycotted by opposition MPs since the start of the budget session. 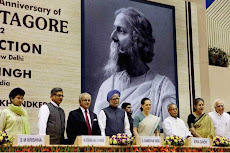 "Let us adopt a resolution urging to award Nobel prize for Sheikh Hasina and send it (to the Nobel Committee)," Babu said just winding up his speech. 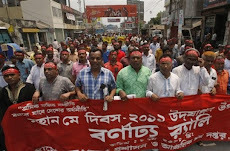 Ashulia, 29 June : Hundreds of angry apparel workers set ablaze a 10-storey building of Hamim Group around 9:45am(bdst) on Monday in protest at the death of two of their co-workers in Ansar and police firing over the past two days at Ashulia in Savar. The ground and first floors that housed the sweater factory in the 10-storey building were burnt to ashes. Three buses and a lorry of the factory were burnt at the time. 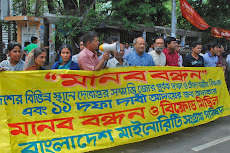 The workers of Bangladesh Export Processing Zone also joined the demonstrators. 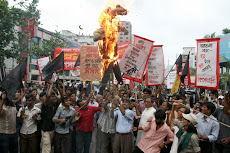 The demonstrators also set fire to a vehicle of Alpha Group, one of the many export-focused readymade garment factories on the outskirts of the capital. 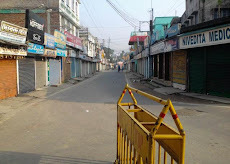 Agartala, 29 June : Outbreak of gastro-enteritis coupled with viral fever and malaria has taken a worst turn in some areas of West and North Tripura districts, claiming at least three lives in a week. According to a report, a few tribal dominated localities under Kanchanpur sub-division in North Tripura along Tripura-Mizoram border were wriggling under severe gastro-enteritis threat as three people died in Dasda Primary Health Centre (PHC) last week. Meanwhile, malaria and viral fever spread in some areas of West Tripura district. Tripura Health Minister Tapan Chakraborty asserted the department had been organising health camps with specialist doctors in all the revenue blocks frequently and urgent camps were also conducted in remote localities. 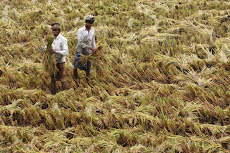 The situation deteriorated because of inadequate rainfall and high humidity, he added. 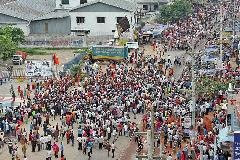 Ashulia, 29 June : Hundreds of garment workers blocked the Dhaka-Tangail highway at Jamgarah on Monday in protest at the death of two of their co-workers in Ansar and police firing over the past two days at Ashulia in Savar. The police tried but failed to disperse the demonstrators who obstructed traffic on the 1.5 kilometre road from 9am(BDST). 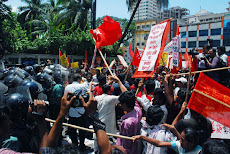 The workers at a rally led by Montu Ghosh, a leader of a garment workers' association, in front of Fantasy Kingdom demanded justice for the killings. 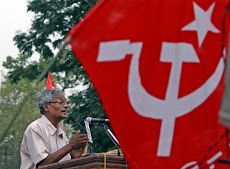 New Delhi, 28 June : The Centre has asked the Left Front government in West Bengal to declare the CPI (Maoist) as an "unlawful association" under a 1908 Act as its scope is much wider than the Unlawful Activities (Prevention) Act (UAPA) enacted last year. 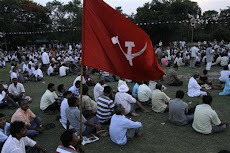 Home ministry officials said West Bengal government has been advised to declare CPI (Maoist) as outlawed because of the fact that the UAPA, under which it declared the outfit as banned on 22 June, is essentially directed against unlawful associations that support secession. "The Criminal Law Amendment Act, 1908 (CLAA) has a very different objective. It is directed against associations which encourage or aid person to commit acts of violence or intimidation. The power is vested in the state government to declare an association as unlawful," a home ministry official said. 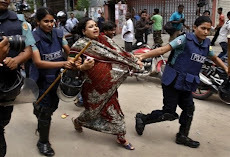 Dhaka, 28 June : A garment worker was killed and 25 others were injured as Ansars personnel yesterday opened fire on agitators demanding a pay hike at a sweater factory in Ashulia. Several hundred protesting garment workers set fire to the Ansars camp at the factory "S Suhi Industrial Park Ltd" in Jamgara and blocked the Dhaka-Tangail Highway for half an hour. Police sources say they lobbed around nine teargas canisters to calm the situation. Bullet-hit Al-Amin (26), was rushed to Dhaka Medical College Hospital (DMCH) where he died during treatment. His colleague Rony also received a bullet and is undergoing treatment at DMCH. The other injured were taken to local hospitals and clinics, witnesses say. 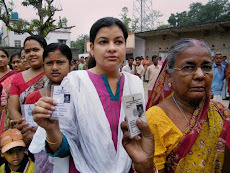 Voting in West Bengal’s 16 municipal polls "peaceful"
န Voting in Rajpur Sonarpur Municipality, this morning. 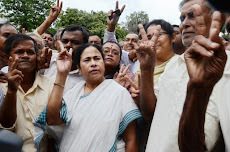 Kolkata, 28 June : Voting was held Sunday for 16 municipal bodies in West Bengal in polls seen as the first trial of strength between the ruling Left Front and the opposition Trinamool Congress and Congress combine after the Lok Sabha elections. 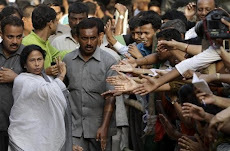 There were reports of a bombing at Maheshtala in South 24 Parganas and Kulti in Burdwan district during the polling, and a couple of policemen sustained injuries. Overall, the situation is peaceful in the 16 municipal areas. 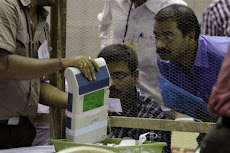 There have been only some minor incidents so far, said state election commissioner Meera Pandey. Barely six weeks after its debacle in the parliamentary elections, the municipal polls have presented an opportunity to the ruling front to assess whether it has been able to regain any lost ground, while for the opposition they are a chance to consolidate the gains. Dhaka, 28 June : Bangladesh Foreign minister Dipu Moni has urged India not to go ahead with the controversial Tipaimukh dam construction until a Bangladesh parliamentary delegation visited the dam site. She has also proposed that a Bangladesh-India joint survey on the project as people were raising concerns against the hydroelectric project. The foreign minister made the proposal as she met with India's state minister for foreign affairs Preneet Kaur in New York, according to a foreign ministry press statement. 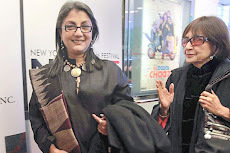 She and Kaur are now in New York to attend a UN conference on global economic crises. 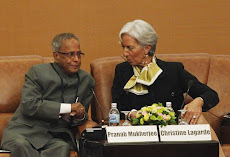 Dipu Moni told Kaur that Bangladesh was banking on the Indian assurance that New Delhi would not do anything "detrimental" to Bangladesh's interest, the statement said. 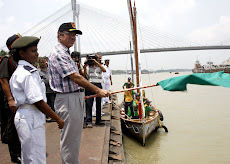 "She (Dipu Moni) proposed meeting of the Joint Rivers Commission and reminded the Indian state minister that joint assessment should be done of the project, as it was widely believed that this would harm the environment of Bangladesh," the statement said. UNI, Port Blair, 28 June : Remote islands of Andaman and Nicobar will soon be getting a 500-passenger capacity vessel named MV Campbell Bay, being built by a Shipyard at Surat. The vessel is in the final stage of completion. ''The sixth and final stage of work is underway for which the vessel has been shifted from ABG Shipyard to Western Shipyard, Goa,'' sources in Andamans told UNI. 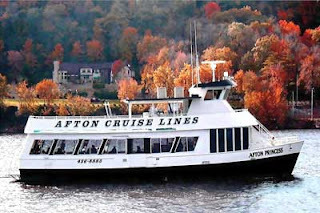 The 500 passenger capacity vessel, once inducted, will further augment the shipping services, especially in far-flung southern group of islands. ''Being built at a cost of Rs 83 crore, the vessel is expected to join the shipping fleet by September this year,'' sources said. 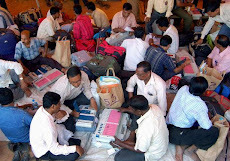 Shipping is the lifeline of Andaman and Nicobar Islands, a group of 572 small and big islands. Out of these, only 36 are inhabited. Most of the inhabited islands of A&N chain are connected only via ferry boats and ships. 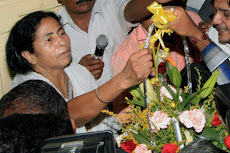 Kolkata, 28 June : A five-year-old girl, who had arrived in Kolkata with her mother on Friday, has been confirmed as suffering from swine flu. 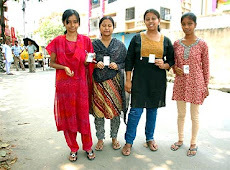 The swab test report arrived at Beliaghata ID Hospital from NICED late on Saturday. The girl, her mother and four-month-old brother had gone to Thailand, Malaysia and Singapore. Another flu suspect, Salt Lake resident Sourav Lahiri, has been admitted there with the same symptoms. His swab test reports are awaited. 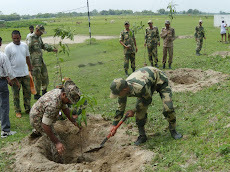 Ramgarh, 27 June : Security forces on Saturday captured key Maoist stronghold of Ramgarh as they launched a two-pronged attack to reclaim areas in West Midnapore district under control of Maoist who offered stiff resistance by detonating landmines and opening gunfire. 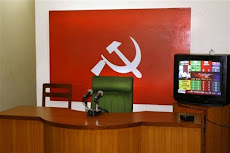 Maoists also torched an office of the Leftist trade union AITUC when they were refused sanctuary in the building shortly before the security forces entered Ramgarh. Security forces headed from Lalgarh in the south and Kadasole, which was secured on Friday, in the north towards Ramgarh this morning, a senior CRPF officer said. 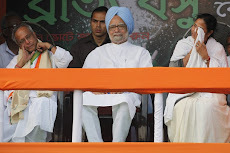 Dhaka, 27 June : Bangladesh Prime minister Sheikh Hasina was fed poisoned food while she was in prison during the 2007-08 military-installed caretaker government, a private TV station quoted a senior Awami League leader as saying on Saturday. 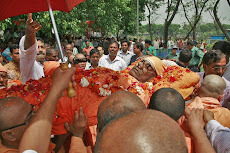 "The leader (Hasina) fell sick having taken the poisoned food and her mouth was swollen. 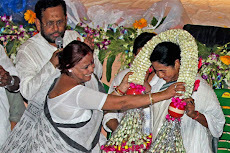 But she never gave in to (pressure)" deputy leader of the parliament Syeda Sajeda Chowdhury said at a programme in the capital. 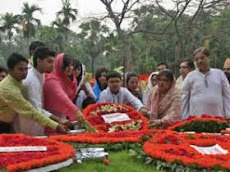 At a discussion marking the birth anniversary of slain national leader AHM Quamaruzzaman in the capital, Sajeda said the prime minister still gets occasional bouts of illness due to the damage caused by the poisoning. 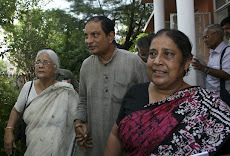 Awami League chief Hasina was arrested on 16 July, 2007 by the Fakhruddin Ahmed-led interim government on a slew of graft charges and was freed on 12 June next year on bail. 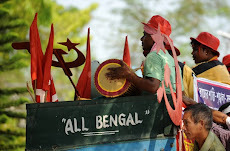 IANS, Kolkata, 27 June : A senior adviser to West Bengal’s Left Front government resigned Saturday to protest against the “torture” of tribals in the state’s Lalgarh area that has just been cleared of armed Maoists who had declared it a “liberated” zone. “I have served this government with all sincerity. But the way the tribals in Lalgarh are being tortured, I never expected this from this government,” Dhirendra Nath Baske, a leading Santhali scholar, told IANS here. Baske, adviser to the state government’s Santhali publication Pachhim Bangla, sent in his resignation to the director of information. “I know the tribal psyche. They never want violence. But look at this government. Their police tortured women and innocent people after the landmine explosion on the chief minister’s convoy at Salboni in November”. said Baske. 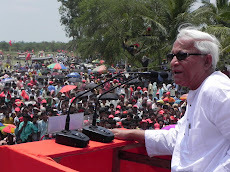 Agartala, 27 June : The Left Front-ruled states of West Bengal, Kerala and Tripura will not adopt the educational reforms outlined by the United Progressive Alliance (UPA) government, a senior CPI(M) leader said here on Saturday. 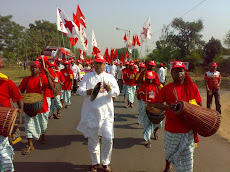 "In the name of educational reforms, the UPA government has been trying to privatise and centralise the education system," a CPI(M) central committee member told sources, on condition of anonymity. 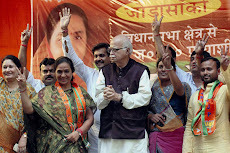 Indian Human Resource Development Minister Kapil Sibal on Thursday announced a slew of measures, including optional class 10 board exams, accreditation agencies for schools, free education and private sector involvement in primary learning. 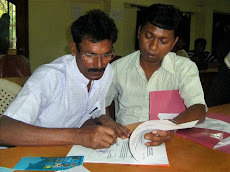 "Before any kind of educational reforms, the union government should take the views of state governments, educationists, guardians, students, intellectuals besides the teachers' and students' organisations," Tripura School Education Minister Tapan Chakraborty. "Any kind of sudden and hurriedly taken decision might affect the future of students and country's educational method," he told media persons here. 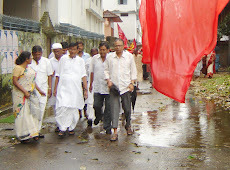 CPI(M)'s students wing, the Students Federation of India (SFI) and Tripura Government Teachers' Association and Tripura Non-Government Teachers' Association, both frontal organisations of the CPI(M), have also opposed the new educational reforms of the UPA government. 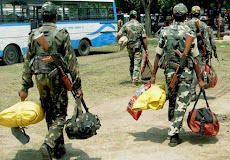 Kadasole , 27 June : Security forces on Saturday continued their offensive to drive out Maoists from the trouble-torn area in West Midnapore district where the Naxals put up a stiff resistance and detonated three landmines. 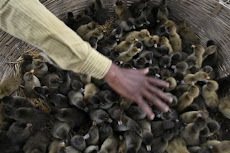 A worker collects dry leather in front of a tannery at the Hazaribagh area in Dhaka. 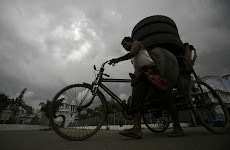 Bangladesh's High Court has ordered the closure of all tanneries and factories across the country if they fail to install effluent treatment plants by 2010 to halt massive pollution of the environment. 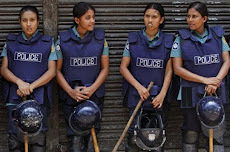 Dhaka, 26 June : The British minister for security and counter-terrorism is arriving in Dhaka on Saturday on a three-day visit, a press release from the British High Commission said. 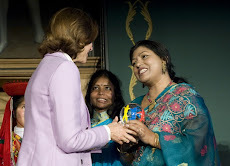 Lord West will see the development of a UK-Bangladesh 'Joint Working Group', proposed by former UK home secretary Jacqui Smith in April 2008. The UK will assist the group to implement rapid anti-terrorism operations by enhancing co-operation. West will call on Bangladesh prime minister Sheikh Hasina, high officials of the government and opposition chief Khaleda Zia, among others, the high commission statement added. 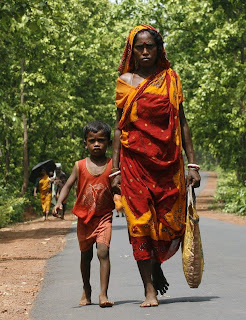 Kumarmari (South 24-Parganas), 27 June : A month after Cyclone Aila hit the Sunderbans, the hungry tide continues to be fought by thousands of hungrier people. On half-empty stomachs, diarrhoea-ridden villagers many of them without homes are still working to keep the rivers at bay. With little governmental help and sapped by a constant exodus of people away from the region, enthusiasm is low and progress slow. External help notwithstanding, many members of the 210 families in the area stayed away from the embankment work. Of those abstaining, a significant number are afflicted by diarrhoea. There has been little to eat here since the cyclone and people are weak. 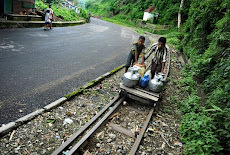 On top of that, because of the water, many are getting diarrhoea. 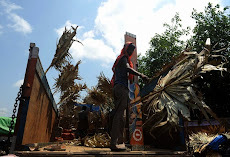 The collapsed houses have to be reconstructed as the rains are coming. But despite this, some are going to work at the embankments so that they can buy food with the money. UNB, Dhaka, 27 June : Chevron, a US-based international oil company, has completed 70 percent of a two-dimensional (2D) seismic survey in hydrocarbon Block-7 located in onshore and offshore areas of the country's southern region. According to official sources, the 2D survey is being conducted covering a total area of 460-km seismic line as part of oil and exploration programme. Of these, 250 km line is in onshore areas while the remaining 210 km seismic line in offshore areas. The seismic areas cover parts of Barisal, Patuakhali, Barguna and Bhola districts located in the country's southern region. As the country has been experiencing a nagging energy crisis, Petrobangla officials believe the 2D seismic survey of the Block-7 may bring good news for the energy sector. 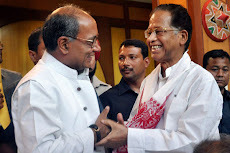 Port Blair, 27 June : The Draft Master Plan, prepared by Andaman PWD, for the capital city of the Andaman and Nicobar Islands has created ripples in this remote archipelago. 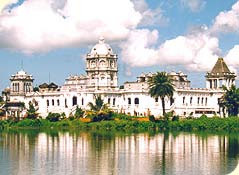 Agartala, 27 June : The newly-constituted Tripura Tourism Development Corporation (TTDC) has stressed on the need to provide standard service to attract more tourists to the state. The Corporation had undertaken various efforts to promote the Tourism industry in the state. A review meeting was also held here yesterday in this regard. According to official sources today, the meeting discussed in details about the existing tourism infrastructure and the need to provide a standard service. The Secretary and Commissioner of Information, Cultural and Tourism department, Nepal Chandra Sinha dwelled on the need to expand the tourism industry and maintain a proper standard. He appealed all to render all possible hospitality services and keep the toilets clean, arrange good food and potable drinking water facilitities, among others. Goaltore, 26 June : Security forces on Friday reclaimed control of Kadasole village to the north of Lalgarh in West Midnapore district from Maoists during the second phase of operations against the naxals who set off two landmine blasts. 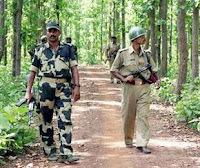 Led by CRPF, the troops including jungle warfare expert and personnel of the Indian Reserve Battalion and State Armed Police, who were helped by a helicopter, traded fire for 45 minutes with the Maoists who later fled the village, a senior CRPF officer told Bengal Newz. "There was no casualty and no arrest," the officer said. "The operations for the day is over and Kadasole has been secured. The forces will be stationed here." The security force launched the operations from Goaltore in the morning, five days after taking control of Lalgarh police station and faced no resistance till Pingboni three km away. 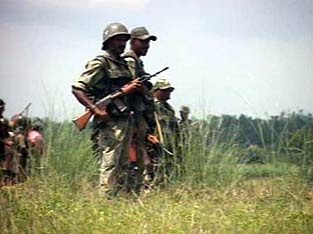 The security forces then moved another four km to Kadasole, where they spotted a group of 15 armed Maoists. 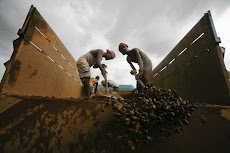 Goaltore, 26 June : Security forces today found four landmines at Kuldiha on the road between Lalgarh and Midnapore town, shortly after an encounter between central forces and Maoists at Kadasole in West Midnapore district. 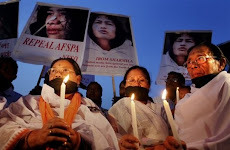 The landmines were set up beside the road connecting Pirakata and Midnapore, which had been santised by the security forces after 19 June, a senior security force official said. The bomb disposal squad had been alerted. 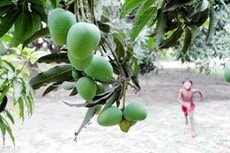 Malda, 26 June : Malda district will organise a three-day Mango and Tourism festival from 3 July at a private hotel premises at Narayanpur. 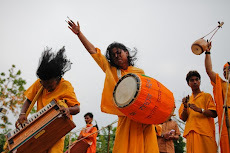 The West Bengal tourism department has allotted funds of Rs 5 lakh to the organisation of the festival. 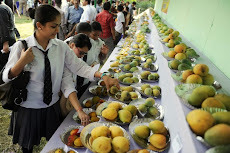 Yesterday, the district administration held a meeting to discuss its preparation.The horticulture department has been asked to take part in the festival and to organise a mango competition. 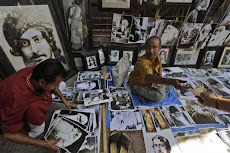 The tourism department has been asked to focus on the tourist spots in the district in the course of the festival. 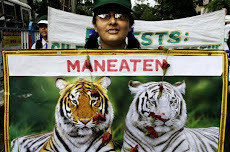 The additional district magistrate, Indrani Saha, is chalking out plans and programmes for the event. န A saleswoman displays a gold necklace at a jewellery shop in Agartala, capital of Tripura today. Jewellers in India, the world's largest gold consumer, chased bullion after prices dropped to a six-week low but delayed monsoon rains raised fears of further declines in demand, dealers said on Friday. BSS, Rajshahi, 26 June : Mayor of Rajshahi City Corporation (RCC) AHM Khairuzzaman Liton said a milestone has been introduced through connecting RCC with the information technology that advanced a footstep towards building Digital Bangladesh. In line with this, he said an IT village would be established in the city and preliminary works on the program has already been started. Kolkata, 26 June : Three members of a family, including a baby, were admitted to a hospital with symptoms of swine flu on their arrival from Bangkok here on Friday. Parthasarathi Das (37), his wife Samita Das (31) and their daughter Suchismita Das (5) were sent to hospital as they showed symptoms of swine flu, Airport Medical officer, S E Dey said. Their sputum and blood samples were sent to New Delhi for tests, he said. 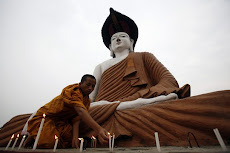 Suchismita suffered from high fever and cough in Bangkok, officials said. The family had gone on a holiday to Singapore, Malaysia and Bangkok on 15 June. Howrah, 26 June : The 222-year-old Indian Botanical Garden has been renamed Acharya Jagadish Chandra Bose Botanical Garden. 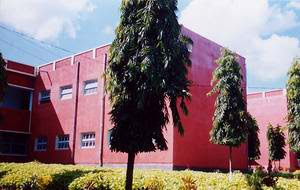 The one of its kind garden at Shibpur in Howrah was named after legendary Bengali scientist Jagadish Chandra Bose by Minister of State for Environment and Forests Jairam Ramesh. Apart from his other scientific breakthroughs, Bose is known for his work in measuring plant response to various stimuli and for scientifically proving the parallelism between animal and plant tissue. 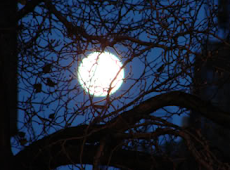 “We have to see that this garden is well maintained and becomes more beautiful. It is our prime focus to protect the nature and Botanical Gardens play an important role in this aspect,” Ramesh told reporters Wednesday here. The largest and oldest botanical garden of South East Asia, the Indian Botanical Garden has been a premier institution for botanical and horticultural research in India. Founded in 1787 by Colonel Robert Kyd, an army officer of the British East India Company, the Indian Botanical Garden now has over 12,000 trees and shrubs belonging to 1,400 species together with thousands of herbaceous plants. The best-known landmark of the garden is The Great Banyan tree with a trunk having a circumference of more than 330 metres. Dhaka, 26 June : Retired career diplomat Ahmad Tariq Karim has been appointed the new high commissioner of Bangladesh to India. 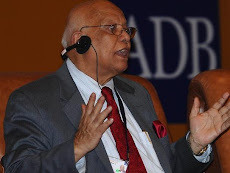 Brought back from voluntary retirement and a sabbatical in a US university, Karim was the deputy high commissioner in New Delhi in the 1980s. 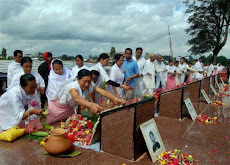 He had served in the Bangladesh missions in Thailand, Britain, India, Iran and South Africa, The Daily Star newspaper said quoting an official announcement. 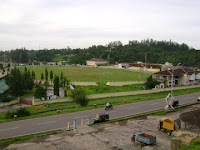 Port Blair, 26 June : Port Blair is truly an amazing destination to visit but even roses carry thorns; so it is better to postpone your Port Blair trip for now. Monsoon is the dampener. 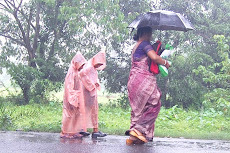 Yes, finally, the monsoons are going to hit the Andaman shore this year. The depression, which hovered over south Gujarat coast for the past couple of days, is now moving fast towards immediate northwest. 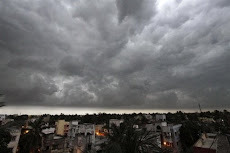 This prediction translates to rain in parts of Chhattisgarh, the northern part of Andhra, and Andaman & Nicobar Islands. 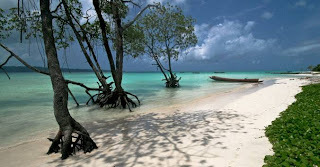 Andaman, being a secluded part of the country, often gets cut off from the rest of India due to incessant rainfall. Both the seaway and airway remain closed till the Weather God smiles. Unless, you are an incredibly lucky traveller, chances are, you might get stuck in the islands for days. Much like the northeast, where landslides close the road, Andaman & Nicobar Islands too have its share of thorns ! 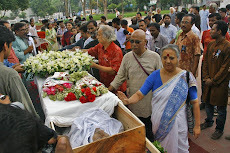 Dhaka, 25 June : Habib Tanvir will continue to live in the world he created through stage, eminent cultural personalities of Bangladesh said of the Indian theatre pioneer who died earlier this month. They noted with deep appreciation Tanvir’s bringing to the cities indigenous theatre forms, using motifs and ideas from the rural areas. Syed Shamsul Haq, Ataur Rahman, Aly Zaker, Sayeed Ahmed and Ramendu Majumdar, among others, recalled the “inspiring presence” of Tanvir who had visited Dhaka to interact with them, The Daily Star newspaper said. 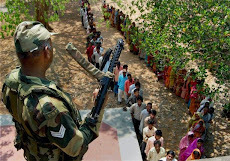 New Delhi, 25 June : The Centre on Thursday sent an additional 600 security personnel to Lalgarh area of West Bengal as part of its operations against Maoists who had laid siege to nearly 50 villages there, home ministry sources said. 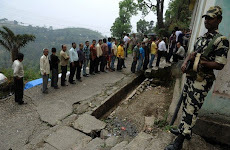 They said six companies of CRPF, which were put on stand by, have now been asked to proceed to Lalgarh, where the forces are almost in the final stages of their operations. 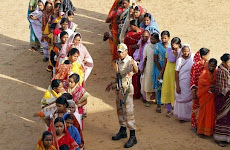 With Thursday’s decision, the total number of central security personnel in Lalgarh region would be about 2,200 personnel. 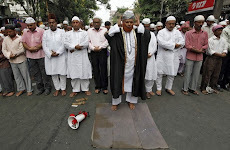 Kolkata, 25 June : Former India captain Sourav Ganguly's ambitious school project in Salt Lake ran into further trouble as an NGO and local residents staged a hunger striker opposite the plot for the project. The NGO, Humanity, joined hands with local residents and roped in eminent artistes like Shuva Prasanna and Sunanda Sanyal who took part in the hunger strike. 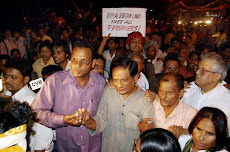 A total of 115 protesters took part in the hunger strike, demanding reversal of the allotment and handing of the plot that allegedly flouted all rules by urban development minister Ashok Bhattacharya. 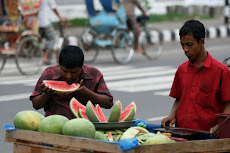 Dhaka, Kolkata, 25 June : The Bangladesh's eighth case of swine flu has been confirmed, the IEDCR said Thursday. "All bar one of the patients recently returned from the United States," Mahmudur Rahman, director of the Institute of Epidemiology, Disease Control and Research (IEDCR), told reporters. 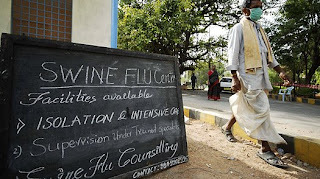 In Kolkata, the seven-year-old girl diagnosed with the swine flu here is stable, an official of the state-run hospital where she is undergoing treatment said Thursday. The girl, who returned to the city from Australia via Bangkok Monday, was admitted to the Infectious Diseases Hospital in Beliaghata after doctors at the Netaji Subhas Chandra Bose International Airport found her with symptoms of the disease. 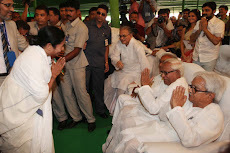 This is the first confirmed case of swine flu in West Bengal. She has been kept in a designated isolation ward, the official said. Brahmanbaria, 25 June : Two people died and dozens were injured when two groups of locals clashed Thursday at Shimrail village in Cosba upazila. 2 were killed in violence among two groups led by Mehari union parishad chairman Muhammad Alam Mian and influential businessman Mustafizur Rahman, a police official said. 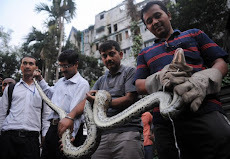 "There has long been a power struggle between chairman Alam and a wealthy local businessman Mustafizur Rahman," said Nikulin Chakma, assistant superintendant of Nabinagar circle. 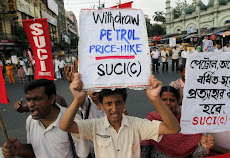 Agartala, 25 June : The Indian government has decided to continue reservation of seats for tribal and other backward community students in the National Institute of Technology (NIT) here after a high court ruling slashed the quota system for the institute, a state minister said Thursday. 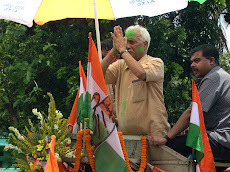 The decision was taken at a meeting in New Delhi Wednesday between union Human Resource Development (HRD) Minister Kapil Sibal and Tripura’s Higher Education Minister Anil Sarkar. 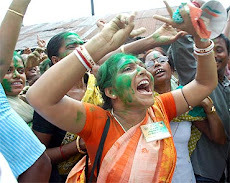 “The minister has agreed to notify 27 percent seats for the other backward community (OBC), 15 percent for the Scheduled Castes and 7.5 percent for Scheduled Tribes students in NIT-Agartala,” Sarkar told Bengal Newz by phone from New Delhi. 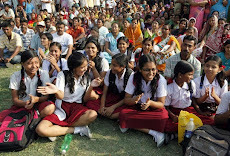 The union minister has also assured to lower the cut-off marks for admission of students from Tripura. The reservation and cut-off-marks controversy cropped up last month following the Guwahati High Court’s order cancelling reservation and the Central Counselling Board’s (CCB) decision to follow a new system for admission in the NITs across the country. 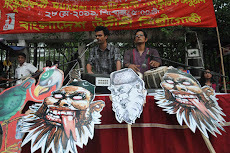 Dhaka, 25 June : Bangladesh is set to protest to the UN against Myanmar’s claim to the territorial sea in the Bay of Bengal, where maritime boundaries have caused disputes and led to stand-offs. Foreign ministry officials told New Age newspaper Wednesday that Dhaka may send in its protest even before the next round of technical discussions with Yangon in mid-July. 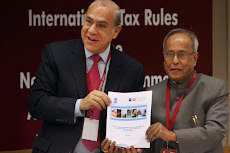 Bangladesh is sandwiched between India and Myanmar and the UN has set a deadline for the three neighbours to submit their claims by this year-end. Apart from finalising its stance against Myanmar’s claim, Dhaka is also preparing to protest Yangon’s claim to a part of the Bay’s continental shelf. 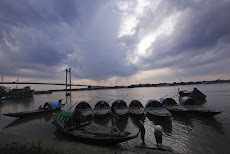 Due to the funnel-like shape of the Bay of Bengal, the claims of Bangladesh, India and Myanmar have apparently overlapped on the issue of the ’starting point’ on how to mark the exclusive economic zone from the coastline. Indian Railway Blog, 25 June : Indian Railways plans to bring the whole of North Eastern (NE) region on the country’s railway map within the next few years under Prime Minister’s ‘Vision 2020′ programme. "Under the current mandate ‘Vision 2020′ all NE states will be brought under railway connectivity,” Shiv Kumar, General Manager (Construction), Northeast Frontier (NF) Railways, told UNI here today.